Flower motif tiles decorate the exterior of these Peranakan houses. 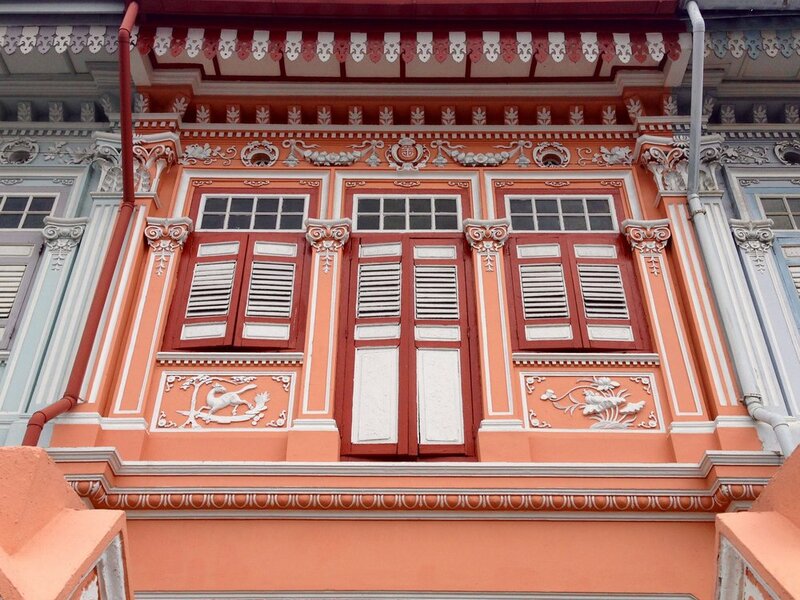 Just round the corner from our office in Joo Chiat road is a stretch of charming pastel-coloured Peranakan houses. These houses along Koon Seng are some of the 518 buildings in Joo Chiat that was gazetted by the Urban Redevelopment Authority in Singapore for conservation. But even before that, these houses have not changed much since 1928. True to the Peranakan heritage, the houses are decorated with intricate motifs and ceramic tiles, mostly inspired by flowers and mythical creatures. As these houses are handed over from one generation to the next, the only facade that has changed is the colour of the paint. And they definitely chose well. Through the centuries, Koon Seng Road has remained largely a quaint residential area lined with vibrant business at the shophouses nearby. Today, the area and very much Joo Chiat are synonymous among Singaporeans and tourists for its multicultural heritage and for being a food haven. We too at Choo Yilin can't help but take a walk around the neighbourhood for a whiff of traditional baked goodies or a chat with skilful artisans whenever we need some inspiration. If you're dropping by Joo Chiat, here's a guide to some of our best kept secrets in the neighbourhood.